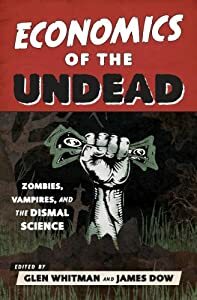 This blog post on ”finances of the undead” compares vampires with zombies to make a point about good personal financial habits. Obviously we approve of zombies, vampires and financial prudence. Indeed, one of my chapters talks about what vampires can teach us about investing strategies. But in some ways I think the author is a little unfair to the zombies when she claims vampires as the better financial managers. After all, vampires start with several advantages including a functioning brain and the ability to speak. They’re also better looking, which economists have found to matter for income. Of course, the undead differ on more than just their financial acumen. In chapter 10, Lorna Piatti-Farnell considers how vampires and zombies represent different aspects of consumerism, vampires as representatives of status-conscious behavior while zombies are more mindless consumers. They return to the mall in Dawn of the Dead because that’s what they know. But do we really want to consider this mindlessness? They know what they want, they try to get it and they don’t care what others think. If you leave aside eating people, there’s something likably simple about zombies. In fact, zombies are now seen as being so reasonable that AT&T uses them to pitch their cable system. Maybe zombies are financially responsible after all. Before we can face the zombies, we need to step back a bit and consider a basic principle of economic organization. Economies are built around connections between people, either through “hierarchical” organizations such as firms (or armies or families) or alternatively through market systems which are decentralized and built around organized systems of exchange. Each method has its own advantages and disadvantages. Hierarchies can be efficient since there is less time spent in negotiation; however, as the size of the organization gets larger, it’s harder for the person in command to have the specialized expertise needed to make the right decisions at each level. Markets, while seeming inefficient, allow economies to scale up in size which implies more specialization and so greater productivity. We see both sides of this in the zombie war described in the book World War Z. The anti-zombie forces are finally organized under a centralized command, which allows quick decisions to be made on how to fight the zombies. On the other hand, it is often the people who are directly engaged in battle rather than the people at the top who are most effective in discovering new forms of weaponry and fighting techniques. Fortunately for the humans, the army command recognizes their efficacy, but if they did not, there would have been no alternate channel for the developers to offer their innovations. The weapon that is the turning point in the war is a new exploding anti-zombie ammunition built in a factory in Hawaii, which is safe from zombies. Unfortunately, the development of this ammunition seems problematic in the environment of World War Z. To make something so sophisticated would require expertise in chemistry, machinery, mining, logistics and a variety of skills that would be spread across the globe in a modern economy. But in a world overrun by zombies, the specialization and trade that these markets would require would become impossible. As the zombies advance and global markets collapse, the things an economy could produce would become less and less sophisticated. I expect World War Z is offering us far too optimistic an outcome. A more likely vision of the new world is given by The Walking Dead, where society has broken down and survivors clump together in small communities such as Woodbury, which is ruled by the authoritarian “Governor”. This world would be built around production in small, local hierarchical organizations such as communities and extended families rather than around long distance trade which would suffer from insufficient support for modern transportation technology and the risk of being eaten (Brian Hollar has a nice chapter in our book that discusses precisely the issues of specialization and trade in a world full of zombies). However, one might think it would be easy to revert back to normal once the zombies are gone; after all, we know how modern technology works and what a functional economy looks like, so it should just be a matter of reproducing what we know. On the other hand, the countries of the developing world know the same things too, and yet many of them still fail to move forward. The typical Econ 101 model of development makes things too simple. It states that poor countries just need to save and as they build up their capital they’ll become rich countries (and yes, sometimes it even happens that way). However, a more sophisticated version of this model says that this only works if there is an effective legal system that identifies and protects property rights. But this just pushes the question back one step: how does political and legal order come about? It often seems that a certain level of economic development is needed before you can have reliable and unbiased systems of property rights. But it also seems that you need those systems in place before true economic development can occur. This could either result in a positive feedback loop where small advances along one dimension promote development along the other or in stagnation where neither gets started because of the lack of the other. The older name for economics, political economy, reminds us that the long-run nature of the economy is not only based on competing firms but also on competing centers of power. How do you move from a dictatorial leader who keeps a community together in the face of the zombie hordes to a system of distributed property rights and neutral arbiters of disputes? Would the leader realize he would need to give up control, or would society have to relive 200 years of revolutionary history to move forward? Personally, I’m not an optimist about either zombies or humans, so I’m not planning for a quick recovery. In his paper, this author constructed a simple model of an economy that produced only widgets and stakes and determined the optimal stake production strategy and how low the humans should drive the vampire population. It turns out that the optimal policy is not to drive the vampire population to zero. Perhaps surprising, but this result shows up in many models of undesirables. Even though we don’t like crime, it’s probably not optimal to spend the necessary resources to completely eliminate it; particularly in the vampire case where the costs are predominantly paid up front while the benefits come in the discounted future. Unfortunately the paper is gated (so may not be available to those without academic access) but I wanted to mention it to assure readers that economists were hard at work on the undead problem. Of course, we were not the first to look at the connections between economics and the undead. Here’s a paper from 1982 that examines the optimal management of humans from the vampires’ point of view. Warning – the paper is very mathematical (much more than we are, but this is what happens when people who like math get bored). Leaving the math aside, the basic idea is that vampires value humans for their blood, but taking blood turns the humans into vampires which both increases the number of predators and reduces the number of prey. The paper develops an approach for determining the optimal number of humans relative to vampires – a “steady state”. It then raises an interesting question. Say that there are currently 7 billion humans but the goal is 15 billion humans. What is the best way to get there? Do you temporary stop killing humans completely to grow the population as fast as possible? Or do you keep killing a few humans now to enjoy the blood even though it will take longer to get to the desired stock? The answer turns out to depend on marginal utility, that is, the amount of enjoyment you get from each additional pint of blood. If the 10th pint of blood is just as good as the first, then you’ll want to get to the steady state as fast as possible (the “bang-bang” solution). On the other hand, if a pint is worth much more when you haven’t had much to drink, a more gradual path to the steady state is better. It’s never this simple, of course. As Glen explains in Chapter 15, vampires have an incentive to behave individually in a way that undermines the optimal solution for the group. Also, if you haven’t had enough of dynamic systems — and who has? — Bishop, Tufte and Tufte take a non-mathematical look at the how the population of zombies might rise or fall over time in Chapter 6. In the wake of the recent financial crisis, the role of the financial system in the economy has been under debate, with some arguing that it needs a complete overhaul, while others making the case that it’s mostly doing fine as it is right now. In the latter camp was Lloyd Blankfein, CEO of Goldman Sachs who said that financial institutions were “doing God’s work”. He received a fair amount of criticism for that statement, but I think they missed the point. The real question is – which god? Here’s what an actual vampire squid looks like. But while a vampire squid may sound scary, it’s far too natural of a creature for us at Economics of the Undead. So I’d like to suggest that Blankfein may have had a different cephalopod in mind.